Gooseneck Trailer Cushion Couplers, are straight and extended for more clearance between you truck and your trailer. These cushioned gooseneck trailer couplers have a vertical cushion inside the vertical tube and a round horizontal progressive shock dampening cushion just above the coupler. The couplers are mechanically cushioned and does not have the maintenance an air-cushion has. Extended cushioned gooseneck trailer couplers give you additional clearance between your tow vehicle cab and the trailer nose, and between the tow vehicle tailgate and the trailer bulkhead. This gives you more clearance for additional trailer swing radius and more room for trailer hook-up. Extended cushioned gooseneck trailer couplers cause less than 100 pounds less tongue weight on your tow vehicle, which will not change your towing experience. To make your towing experience better yet, all cushioned gooseneck trailer couplers are fitted with premium “self-latching gooseneck trailer couplers” for the standard 2-5/16 gooseneck ball. These couplers latch when the trailer is lowered onto the ball. To uncouple, you simply pull a release cable located near the trailer jack handle. The couplers have a molded hitching guide for easy coupling. The couplers are precision cast of Chrome Vanadium Steel with a Stainless steel latching pin and a stainless steel spring. The couplers carry a V19 rating of 28,000 pounds and was tested to 42,000 pounds to gain this rating. These couplers also have a hole in them for use of a long stem padlock. The image below shows the body of the padlock inside the coupler, I do not recommend that because there may not be room to put your key in it to remove it. Place the body to the outside of the coupler. Cushioned gooseneck trailer couplers are fabricated using extra heavy wall high strength tubing for maximum strength, not pipe and especially standard wall pipe as other manufacturers use. Cushioned gooseneck trailer couplers are rated at 24,000 pounds gross trailer weight. 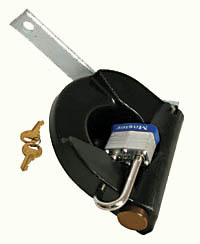 The CC2 Cushioned gooseneck trailer coupler is a straight no off-set 4 inch round trailer stem. 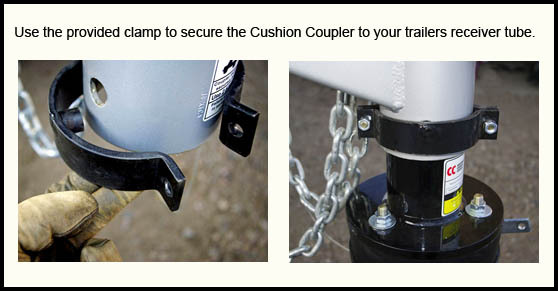 The CC2 is furnished drilled for use on trailers with a safety through pin. However, the pin cannot be used because of the internal mechanism of the CC2 Cushion Gooseneck Coupler. Instead of using the through pin, the CC2 is furnished with a studded collar to safely lock the unit in place. The CC2 is okay for trailers with no through pin hole and two set bolts. The CC4 has a 9 inch extension and a 4” Round trailer stem. The CC6 with a 9 inch extension and a 4-1/2 inch square trailer stem. The CC8 is a 9 inch extension with a 4 inch square trailer stem. CC6 - 9`` off-set for 4-1/2`` trailer stem.